Drawing upon a six-year research project at the Stanford University Graduate School of Business, James Collins and Jerry Porras took eighteen truly exceptional and long-lasting companies and studied each in direct comparison to one of its top competitors. They examined the companies from their very beginnings to the present day -- as start-ups, as midsize companies, and as large corporations. Throughout, the authors asked: "What makes the truly exceptional companies different from the comparison companies and what were the common practices these enduringly great companies followed throughout their history?" Filled with hundreds of specific examples and organized into a coherent framework of practical concepts that can be applied by managers and entrepreneurs at all levels, Built to Last provides a master blueprint for building organizations that will prosper long into the 21st century and beyond. Drawing upon a six-year research project at the Stanford University Graduate School of Business, James Collins and Jerry Porras took eighteen truly exceptional and long-lasting companies and studied each in direct comparison to one of its top competitors. They examined the companies from their very beginnings to the present day -- as start-ups, as midsize companies, and as large corporations. Throughout, the authors asked: "What makes the truly exceptional companies different from the comparison companies and what were the common practices these enduringly great companies followed throughout their history?" 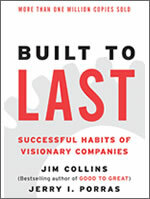 Filled with hundreds of specific examples and organized into a coherent framework of practical concepts that can be applied by managers and entrepreneurs at all levels, Built to Last provides a master blueprint for building organizations that will prosper long into the 21st century and beyond.